Hogue revolutionary O.M. Series stocks (Pat. Pending) are made similar to their popular rubber grips. 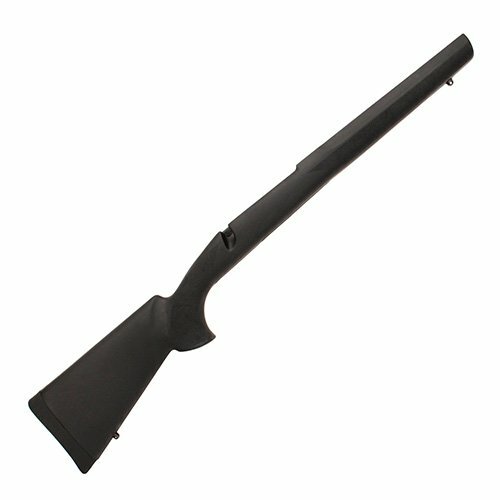 Constructed by molding a super strong, rigid fiberglass reinforced stock that precisely fits the rifle action. This small "stock" or "Skeleton", is then completely overmolded with the same rubber compound used on Hogue grips. The Skeleton or insert, as it is called, chemically as well as mechanically adheres to the rubber resulting in a permanent bond between the rubber and the insert. The super strong insert not only gives the stocks their strength but the precise molded dimensions provide a perfect drop in fit of your rifle action. OverMolding with rubber is superior in every way and provides the ultimate in a comfortable, non slip, super smooth attractive finish, that is durable and extremely quiet. All the following custom features come at prices comparable or below any other standard synthetic stock on the market. Hogue stocks incorporate every desirable feature a fine rifle stock should have and by adding unique Hogue touches they have created a much superior and unique stock compared with anything on the market today. Features include a sleek straight comb, palm swells and a "varminter" style forend which are treated with a unique "cobblestone" texture. Hunters especially will be attracted to the incredible quietness of these stocks coupled with lightweight, superior non-slip comfort, and accuracy. Center fire rifle stocks all come equipped with the finest in recoil pads. Hogue recoil pads are formulated and molded from a "super cushion" blend of recoil reducing materials that rivals and even surpasses any other pad available. SPECIAL material coupled with computer designed, internal cushion structure provides outstanding recoil control and shooting comfort. All center fire bolt action models come standard with aluminum pillar Bedding. Pillar Bedding is normally a gunsmith installed custom option costing over $100.00.